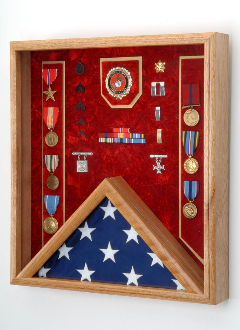 Our US Marine Corps Flag medal display case is made of finely crafted wood with an elegant walnut finish. This US Marine Corps Flag medal display case is ideal for displaying medals, memorabilia, certificates and a flag. Our US Marine Corps Flag medal display case shadow box is made in the U.S.A. The size of this US Marine Corps Flag medal display case is 18” wide x 20” tall. This US Marine Corps Flag medal display case was exactly as described. It blends in beautifully with the furniture in my office. Thanks for the prompt delivery and superb customer service , who handled all of my concerns in a professional, yet friendly way.